JANUARY 29, 2010-- The International Film Music Critics Association announces its list of excellence in musical scoring for 2009 with composer Michael Giacchino receiving nine individual nominations, the most for any composer in a given year since the Association began issuing awards in 2004. Along with multiple mentions for his score to the Disney Pixar movie UP and JJ Abrams’ reinvented STAR TREK, Giacchino receives nominations for his scores to the TV series LOST as well as the documentary EARTH DAYS. Giacchino is also nominated for Composer of the Year along with Alexandre Desplat, James Horner, Christopher Young and Brian Tyler. Both UP and STAR TREK are nominated for Score of the Year, along with James Horner’s score to the worldwide blockbuster AVATAR and Christopher Young’s score to Sam Raimi’s DRAG ME TO HELL. These film scores are tied with the most nominations this year at four noms each. Alexandre Desplat’s score to THE TWILIGHT SAGA: NEW MOON rounds out category. 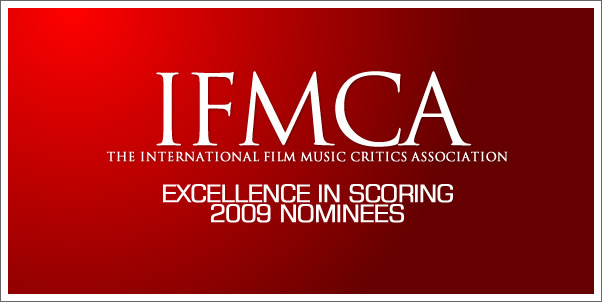 Previous IFMCA Score of the Year Awards have been awarded to Alexandre Desplat’s THE CURIOUS CASE OF BENJAMIN BUTTON in 2008, Dario Marianelli’s ATONEMENT in 2007, James Newton Howard’s LADY IN THE WATER in 2006, John Williams’ MEMOIRS OF A GEISHA in 2005 and Michael Giacchino’s THE INCREDIBLES in 2004. The IFMCA strives to encompass and champion all genres of musical scoring and the composers who excel in them. Running the gamut of writing for theatrical movies to music for video games, composers all have the same job and that is to enhance the vision of their project with music. As such, the IFMCA acknowledges the broad spectrum of ways in which artists can write unique and varied music for their medium.